The Blank Wall by Elisabeth Sanxay Holding is the last novel from the 1940’s in my first volume of the Women Crime Writers collection. (I skipped Dorothy Hughes’s In a Lonely Place as I have reviewed it before.) I must say that all of them have been excellent. Lucia Holley is an ordinary upper-middle-class housewife trying to cope while her husband is away at the war. She has been having difficulty with her seventeen-year-old daughter, Bee. Recently, she found out that Bee was seeing an unsavory character, Ted Darby, who is 36. When she visited him to ask him not to see her daughter anymore, he refused. Bee has found out and is furious. That night, Lucia spots someone in their boathouse and catches Bee on the way out to see Ted. She refuses to let Bee out, and her old father, Mr. Harper, overhears. Later he tells Lucia that he went out to tell Darby to leave and pushed him into the water. Early the next morning, Lucia goes out for a swim and finds Darby dead in the bottom of the boat. He has fallen on the anchor, which has pierced his chest. Determined to protect her father and her daughter’s reputation, Lucia disposes of the body. But horrible events are just getting started. At first, I was a bit impatient that Lucia’s fear for her daughter’s reputation has her cover up what is, after all, an accident. However, this story pulled me along, so that soon I was completely immersed in Lucia’s problems. I just felt that it wouldn’t have hurt Lucia’s spoiled daughter to find out the troubles her little rebellion caused. Overall, I am so far impressed by the quality of the novels in this collection. 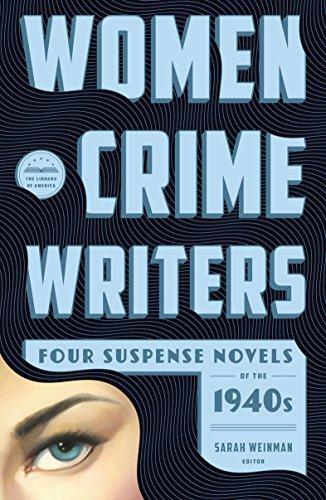 They are not as well known as contemporary thrillers and crime writers written by men, but they are better than many of them. I really liked The Blank Wall — I’d seen the movie adaptation from 2001, it’s called The Deep End and it’s excellent. The filmmakers made a very timely update which I think gives it an interesting twist to the plot. Oh, really? I’ll have to watch for it. I suppose as a daughter one would wish for a mother like her, but I, too, wished that the children had just a little blowback from the complications. She seemed to have to shoulder a lot (including, however, the concern for her father). In that era, I suppose girls would be being taught to look forward to having a husband to take care of all the mess that could be caused by her selfishness. Of course that didn’t lead to a happy marriage for either party. Yes, but the daughter herself was really headstrong for that time, too.